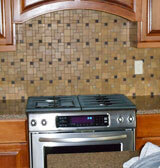 If your kitchen is filled with 1980s wallpaper, give it an updated look with a tile backsplash by your countertops. Match your kitchen tile backsplash with your kitchen tile floors for a truly uniform and complementary look that turns the room from drab to fab. Work with our designers on the pattern you want to create something truly unique. Choose a solid pattern or a mosaic that stands out and becomes the envy of guests. 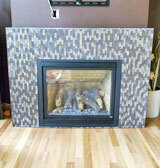 Your fireplace also takes on new life with our modern tile backsplashes. Let us tile your new fireplace or give your old fireplace a brand-new look that stands out in your living room or family room. Our team is always there to listen to your ideas and come up with some advice of their own that results in a truly creative combination.